Many customers have asked me what they should do to make their pool stand out. Of course, adding a pool to your backyard makes a dramatic statement by itself! But with the right options, the entire space can look like a work of art. Sometimes small details make all of the difference. Here are four ideas that can work together to give your pool that WOW FACTOR! All water features are popular due to the calming sound of splashing water and the relaxing visual of water in motion. Deck jets produce streams of water hidden in your deck that flow into the pool. You can usually adjust the stream height, direction and pattern. They can be a bit noisy if turned up high (but kids love the noise!). Rain archs are like sheets of rain arched up at a 45 degree angle that have a great soft audio. Other variations include cascades, cascades with spillways and other rainfall effects. Nice audibles! Other water features of course, there are endless possibilities for water features but some of these can be quite expensive, such as rock formations with spillways. Imagine a deck that looks like natural stone, but it’s actually made of less expensive material—that’s the draw of stamped concrete: it’s shaped, texturized and colored to resemble a wide variety of materials. You can achieve nearly any look with stamped concrete, with all of the benefits of concrete: durability, design flexibility and lower cost than the material being imitated. 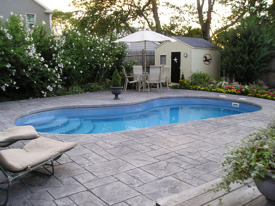 Stamped concrete is art, so you definitely want to work with a craftsman. Your pool professional should be skilled in coordinating design of the deck, pool and landscaping—especially if you are using stamped concrete. Expect to pay about $12 - $13/SF, and to reseal the concrete every three years or so to keep its luster. Your backyard can look magical with something as simple as lighting. Colored lights are an inexpensive way to really add spark—and they look amazing highlighting deck jet and rain arc water features. LED lights are more vibrant and they burn longer than other types. Consider light shows and other multi-color options for a vibrant effect. We recommend LED lights from Hayward, Pentair or SAVI, and can help you choose. Why settle for just a table and chairs, when you can add cozy sofas, a bar, kitchen island, fireplace and/or pitsand other conveniences. 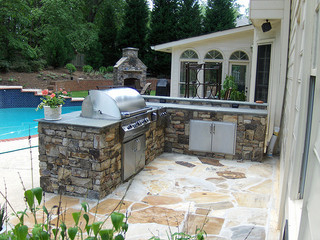 Living space has moved outdoors [http://www.vikingpools.net/outdoor-living-spaces.php]—and can be focused around the pool for complete comfort in sunny and shaded areas. You may have more options than you realize, so make sure to discuss potential ideas with your pool builder. The above list is by no means exhaustive, but it does present some very popular WOW FACTOR options that Hoosiers like. Interested in other options and features for your pool? Download our free Pool Buyer’s Guide.